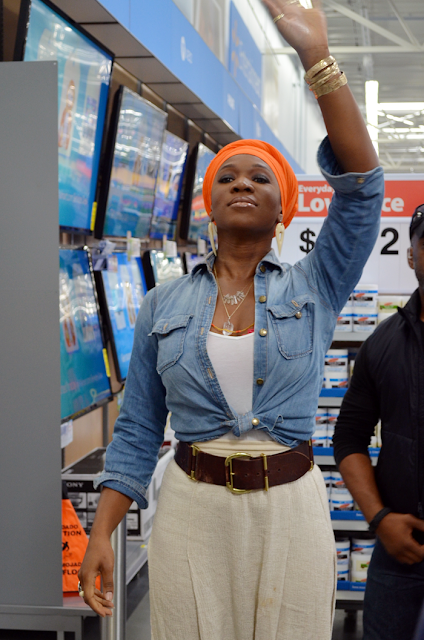 On Friday I had the absolute pleasure of meeting Grammy Award winning recording artist, India Arie. I have been a long-term fan and remember her from days gone by when she performed here locally at an event called Funk Jazz Cafe. Those were great times and she is still as hot as ever with her recently released album, Songversation. I love her positive lyrics, the musicality in her songs and the fact that with this album she said she just let go and did it, trying to avoid the perfectionism that she strove for in the past. This benefitted her because the album is amazing and her fans are loving it! 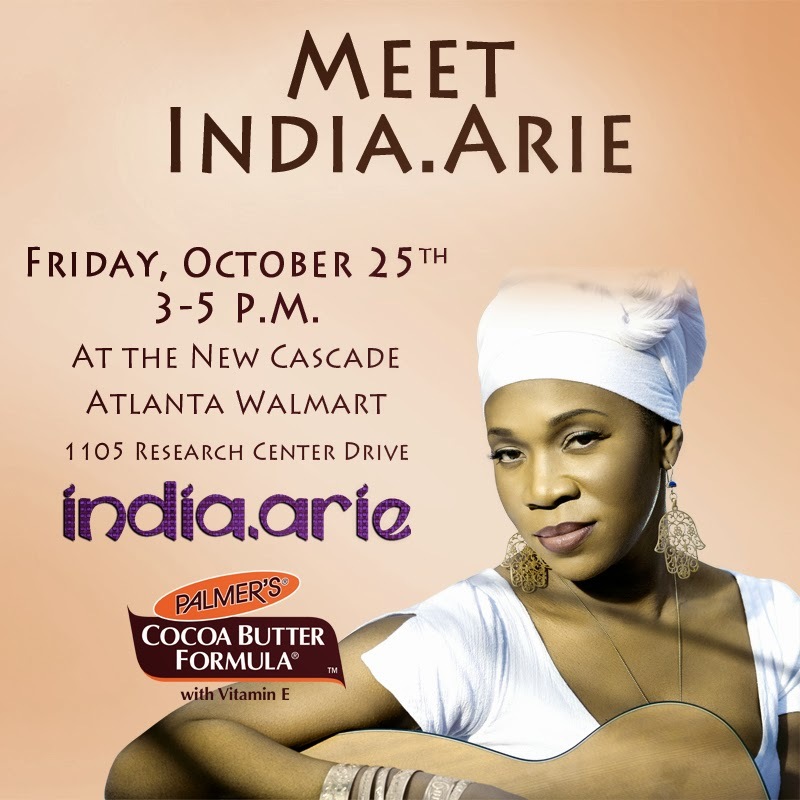 I was invited to meet India by Walmart at the newest store location in the Cascade area of Atlanta. 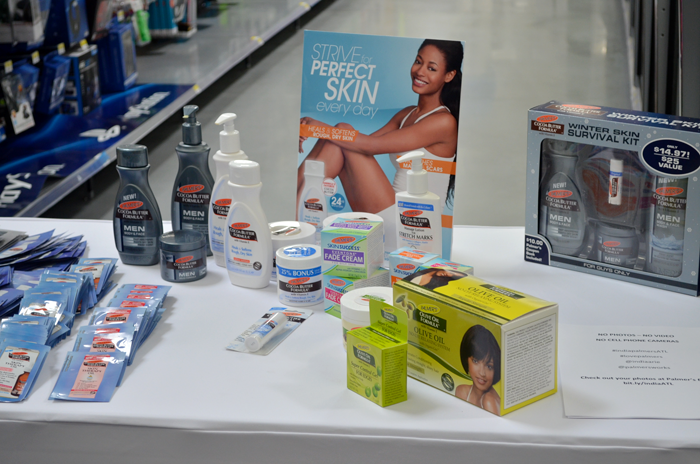 The meet and greet was sponsored by Palmers Cocoa Butter and if you aren’t familiar with them their creams and lotions are always in my arsenal and have been for years. India has a song on her album titled Cocoa Butter and Palmers if featured prominently. The hook “you are like cocoa butter on my heart” resonates with me because cocoa butter is widely used for healing scars. It gives me chills just thinking about it! The fans waited patiently for India to make her appearance and when she did it was with a kind and loving smile that was appreciated by the crowd who couldn’t wait to meet her. I was able to get a quick photo with this songstress who is as tall and regal in real life as she looks in her photos and on tv. Looking at our photo I am reminded of one of my favorite songs that she has penned, Brown Skin and I can certainly attest to the fact that using Palmer’s cocoa butter keeps my brown skin well moisturized and looking right! 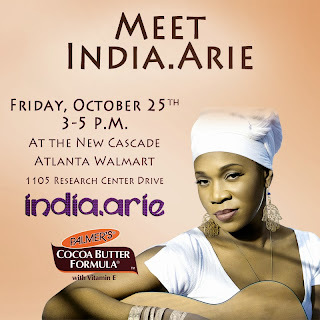 I just have to add that I love my job and I am so very grateful to Walmart for providing me with the opportunity to meet India Arie, an artist whom I have long admired.